Join us for a Beauty Party! The application for the 2013 session of the annual Human Rights Advocates Program (HRAP) at Columbia University is now available. We would like to ask you to disseminate this announcement to eligible human rights activists and organizations. The application is available online at http://hrcolumbia.org/hrap/apply/. This web-based format is the only version of the 2013 application. The Program is designed for lawyers, journalists, doctors, teachers, social workers, community organizers, and other human rights activists working with NGOs on issues including sexual and gender-based violence, domestic violence, minority rights, LGBT rights, disability rights, labor rights, migration, health, HIV/AIDS, social exclusion, environmental justice, and corporate social accountability. Auditions for "Alice in Wonderland"
Auditions for our 116th season winter Mainstage production, "Alice in Wonderland", will be held this month. Directed by Liam Shea. "The adventures first...explanations take such a dreadful time." When Alice's parents decided to move to Tokyo she could never have imagined how bored and isolated she would be. However one day during a particularly boring Japanese lesson a white rabbit takes Alice by the hand and leads her into a fun world she didn't see before. A world where Sumo wrestlers recite poetry, expat wives keep pigs for babies and having a cup of tea is like an assault course. Go a little bit mad this winter and take part in TIP's production of "Alice in Wonderland". We're looking for people who are willing to be a bit silly and take a fresh look at Lewis Carroll's characters. You can have lots, little, or no experience, but the main thing we're looking for is people who want to have fun and be creative! at Temple University on human trafficking in English! * Polaris Project Monthly Seminar "You Know Human Trafficking?" 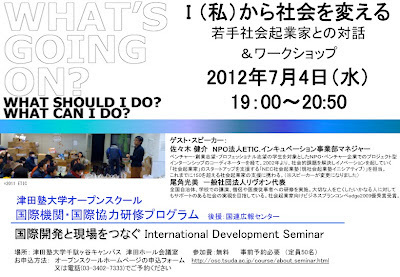 First Seminar on July 16 2 pm- @ Waseda University Nishi-Waseda Bldg. 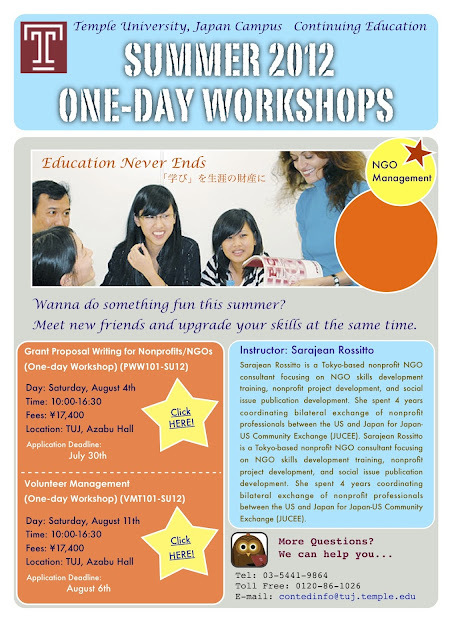 Polaris Project Monthly Seminar is entering its third year! We are presenting the first seminar in July. all about human trafficking in Japan. Human trafficking? It is a problem in a far away country, is it? Is it all over the world? What? I'm one of the perpetrators?? U.S. Department of the State releases an annual human trafficking report. among the countries in this tier. human trafficking in Japan on June 20. PiNK Magazine is now bilingual. Thursday, Friday and Saturday evening performances @ 7.30pm Saturday and Sunday matinees @ 2:30p.m. Director: Andrew Robinson Sexual taboos, old fashioned values, parenting, racism, manliness, sexism, gender identity, guns, patriotism, sacrifice, and war all get questioned in this modern classic about family and society. * Note: not appropriate for children. Change.org Japan needs your support!